Before coming to visit the band raised £1,412.50 for the project through concerts and CD sales, and since their sax player, Stuart MacDonald, owns a music shop, they were then able to subsequently use that cash to buy 7 brand-new alto saxophones at trade price. 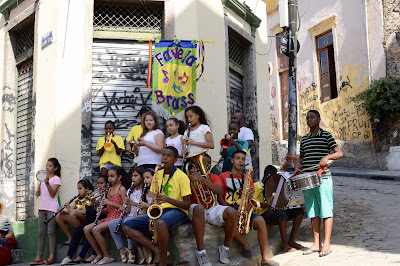 Favela Brass is expanding into the local state schools this year, and this will be absolutely vital in allowing us to include saxophones as part of our program. 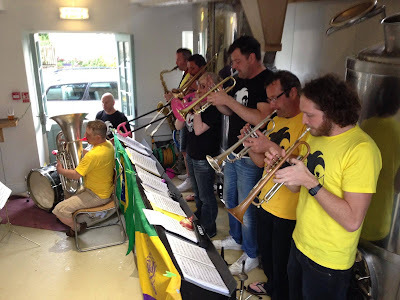 It really has been an amazing week and we are very grateful indeed to the New York Brass Band and all those who contributed to their fund raising efforts for the lift their visit has given us. On May 13th there is going to be a music festival at Doncaster dome to raise money for Favela Brass and Doncaster Youth Jazz Association. Lots of great local musicians and bands are donating their time and talent to help give the gift of music education to children in the U.K and Brazil. 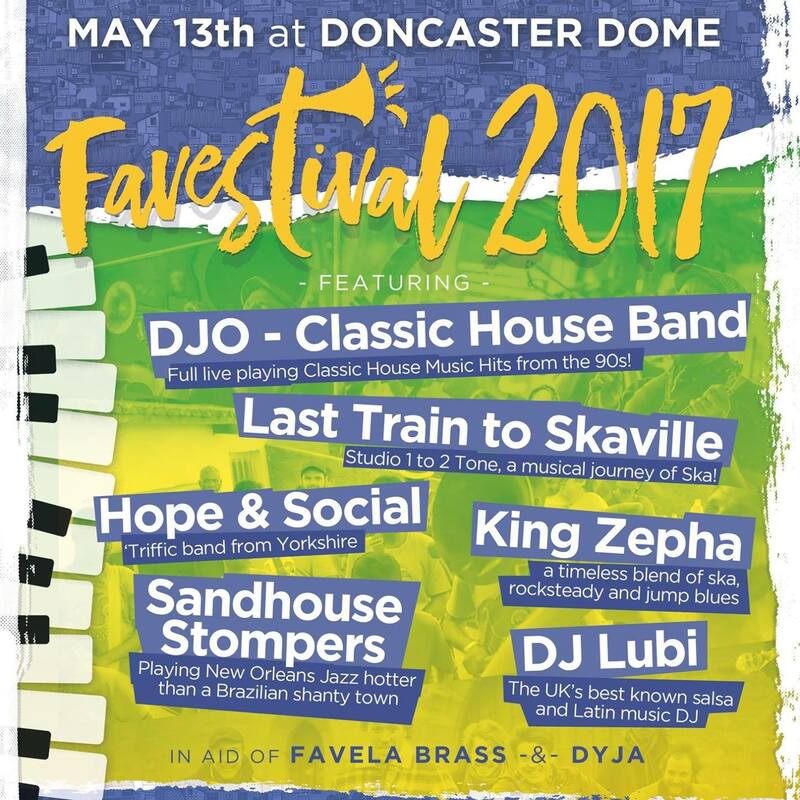 PLEASE HELP US BY WATCHING THE FOLLOWING VIDEO AND BUYING TICKETS TO Favestival online, at Doncaster Tourist Office, Doncaster Dome or from the Doncaster Youth Jazz Association. Those who can't make the Festival but would still like to donate can do so via the Favestival Crowdfunding page. Two Appearances on the BBC in one week! 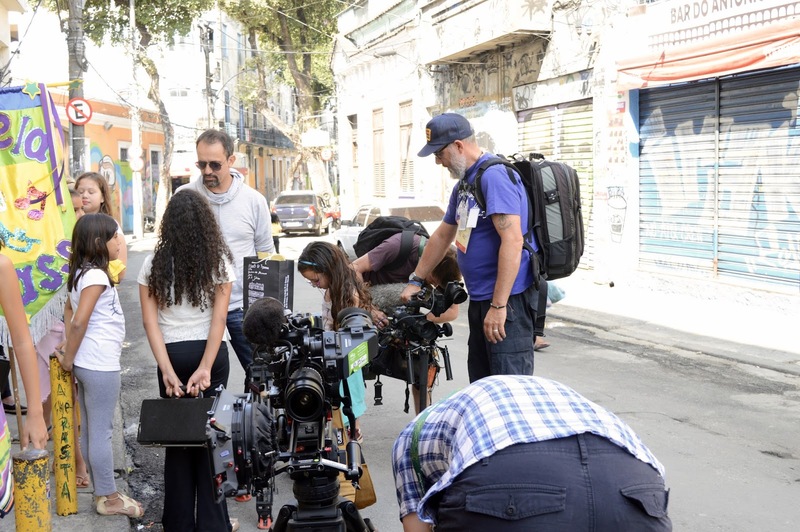 They say that lighting doesn't strike twice, but Favela Brass has just appeared on the BBC two times within the space of three days! It's an amazing moment for the project and we're all incredibly happy that the Olympics really did provide us with opportunity that we were all hoping for in terms of spreading the word about our project. The task now is to find a way to convert all of this fantastic publicity into music lessons for our kids. On that note, if anyone who hasn't done so already would like to contribute financially, our Just Giving page will remain open for the duration of the Olympics. All pounds/dollars/euros donated are much appreciated and will go a long way. An Olympic Dream Come True? "No, but wait, maybe the fact that you guys don't have anything IS your Olympic story, maybe it's all about the struggle of the kids and the teachers to get included in the Olympics over the next year." 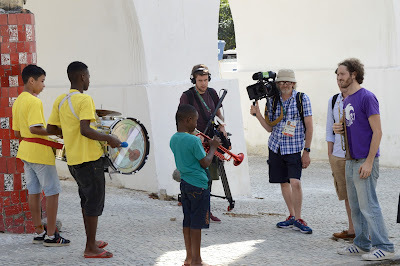 So we set ourselves a concrete goal and shared it openly with the children: we were going to try to get Favela Brass involved in the opening ceremony of the Olympics. We shared videos about our objective, got out in streets playing shows and publicising it, and pestered all of our contacts mercilessly. The idea was that either way the kids would hopefully gain a valuable life lesson from the experience: if we didn't get it, the kids would learn that having a dream and working hard towards it is worth it, even if it doesn't come about exactly as you had planned - because even without the opening ceremony all that training and playing in public had to take us somewhere. On the other hand if we did make it, it would teach the children that if you really go for stuff, there's a good chance you will make it. As it happened, we didn't make the opening ceremony of the Olympics. So we regrouped and came up with a plan to take the project to the streets with an program of 16 shows in 16 days for Rio 2016. We didn't get the opening ceremony, but we weren't going to be left out. Contact was indeed made, and today the BBC filmed a clip of our children playing the same tune in various locations. It was an extremely proud day for me. The kids played absolutely out of their skins and I think it's fair to say that the team from the beeb were suitably impressed. "It's for the end of the BBC 1 show tomorrow night for the opening of the Olympics - because of the time difference, the opening ceremony starts at midnight in the UK so not that many people will watch it. Your bit will go on just before 10pm so you'll probably hit a much bigger audience." Many are the slip between cup and lip. The material still has to be edited in time and it presumably has to be approved, but there is now a good chance that the BBC's prime time 8:30pm "Countdown to Rio" show tomorrow night will end with our kids playing a familiar Olympics-related tune to their own uniquely Brazilian beat. That for me would be even better than us participating in the opening ceremony. Of course it may not happen. Even if it doesn't I'm still immensely proud of the kids, and we'll make our mark on the Olympics whatever. ...but wouldn't it be nice? Sandhouse Stompers Coast to Coast Mardi Gras 2016 - Thank You!!! Great news! 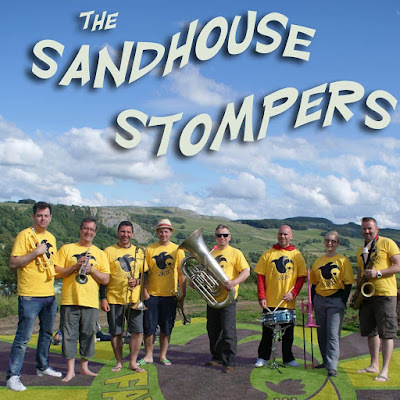 The The Sandhouse Stompers Coast to Coast Mardi Gras 2016 has raised £4385, smashing last year's total and making a HUGE contribution to our ability to sustain Favela Brass. This is an ABSOLUTELY MASSIVE boost to the project! Favela Brass has had quite a bit of media attention recently, and a variation of the same question generally comes up every time: "how does a Yorkshire man end up running a music school for kids in a favela in Rio de Janeiro?" It seems a bit bizarre at first glance, but there is a link. 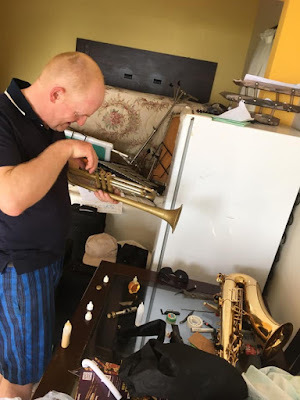 I benefited from a great music education, courtesy of Doncaster Music Service and Doncaster Youth Jazz Association and have come to realize, even more with hindsight, the incredible value of music education for children, whatever their background - both for the children involved and for their local communities. That is what eventually led me to start a music school in a favela and I have no doubt that it is exactly the same feeling that inspired the 8 professional musician friends that make up the Sandhouse Stompers to clear two weeks of their diary to walk and play their way across the UK to raise money for Favela Brass, and inspired such a generous response from our donors. 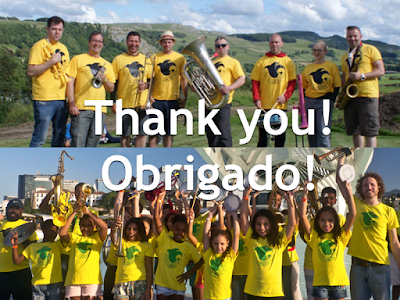 On behalf of the children, teachers and families of the Favela Brass, then, I would like to thank the walkers, the special guests, all who helped along the way, all those who kindly donated and came along to support the walkers during their shows, all who helped to arrange the pre and post-walk fundraisers, UK charity Volunteer in Brazil for their support, and especially Stuart Garside for creating and organizing the whole event. This really will make a HUGE difference! Some debts of gratitude are impossible to repay, and this clearly falls under that category. The best I can do is run Favela Brass to the best of my ability and see that the money is used in the best possible way to provide the kind of opportunity that we had to a group of Brazilian children who sorely need it. I only hope that the story of Favela Brass can one day justice to your generosity. We hope to raise as much money as possible for Favela Brass through sponsorship, musical performances and impromptu busking en-route, but we need your help! If you can offer us a field to pitch our tents, can provide us with pies or frosty libations, we would love to hear from you. If you want to walk with us, play with us or rattle some collection boxes for us you are more than welcome to join us." 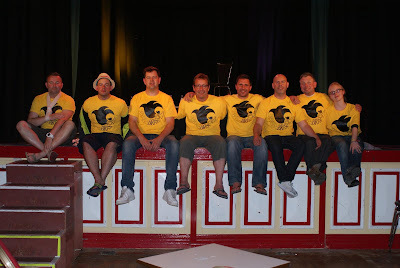 26th July Helmsley Brewing Co. 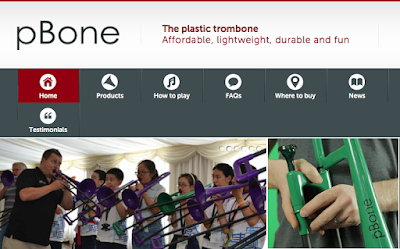 Even before the walk has started the Stompers have already managed to secure a donation from the instrument manufacturer pBone of 2 plastic trombones and 3 plastic trumpets, which will be winging their way over Rio and into the hands of our students shortly - what an amazing start to a fantastic fundraising initiative! A huge thank you also to UK Charity Volunteer in Brazil for supporting this event. 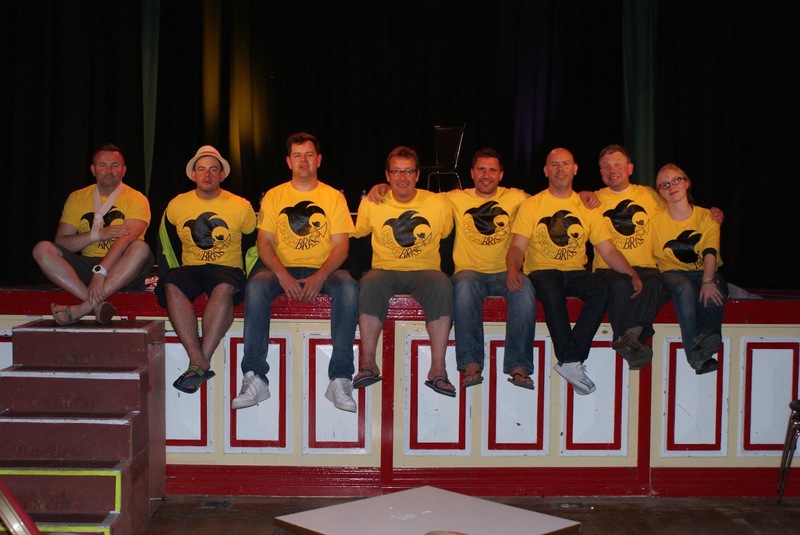 A big thank you to Benjie Guy and Jon Bithrey for coming to visit our show last weekend and producing this lovely piece about us in the run up to the Olympics.